A gentleman was looking for earrings as a xmas gift for his wife to match a pendant she loved but he couldn’t find anything suitable. We suggested he brought the pendant into the store and we could create earrings to match. We sourced an exact matching stone for the earrings and sarah handmade them into a rubover setting. Job completed in 10 days and customer was delighted. We hope his wife liked her present on xmas day. 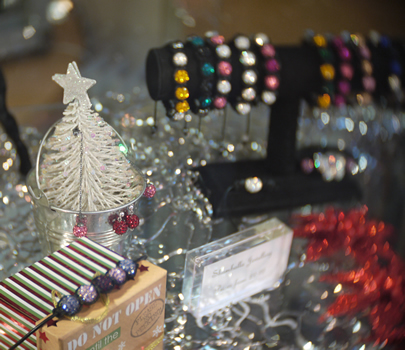 We have a lovely range of jewellery in the shop all handmade by our jeweller Sarah. Shamballa style bracelets in great designs with genuine Swarovski crystal beads and braided leather with necklaces and earrings to match. Sarah can make items to order if you prefer specific colours, prices from £9.99. Shamballa style bracelets in great designs with genuine Swarovski crystal beads and braided leather with necklaces and earrings to match. Sarah can make items to order if you prefer specific colours, prices from £9.99. We are an independent jewellery workshop based in Dundee, Scotland. Our core business is jewellery repair work and we have a talented team in the store. We are creating one off pieces of jewellery to sell on Etsy to showcase our skills, if you have any special requests we can custom make pieces. 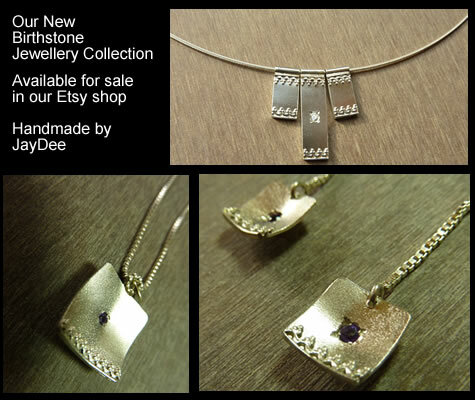 The items for sale on Etsy (necklaces and earrings) are handmade in Silver with a selection of birthstones – eg amethyst, ruby, cubic zirconia and sapphire. 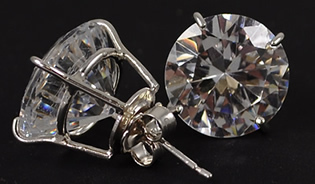 Handmade 3 carat CZ earrings – the stones are huge 15mm diameter. Earrings commissioned by a postal customer.